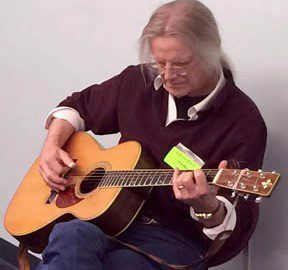 Bennett Hammond started playing guitar in 1957 and began teaching in 1960, debuted as a virtuoso soloist in 1980 on the In-Bound platform, Harvard Square Station, and has played above ground, at home and abroad ever since. Bennett picked up banjo at BCN ten years ago. Early influences include an EP side of folk and cowboy songs with guitar accompaniment his sister Lucy made in 1951, recordings of Etta Baker, Mike Seeger and Duane Eddy, and of course the Three B’s – Bach, Bluegrass, and Bo Diddly.